As to carrying stuff while on the bicycle, backpack? As to the explanations from the campus police.....amusing. Works in your favor, but amusing. I have the panniers for carrying stuff on the bike already but don't have a rack on this bike. I don't like to wear a backpack while riding a bicycle for the same reason as not using one on a motorcycle. The reason I used the bicycle this morning is I noticed the red curb at the motorcycle parking areas and suspected that they would use that as an reason for a ticket. Plus, I really needed the exercise. Sweeet! 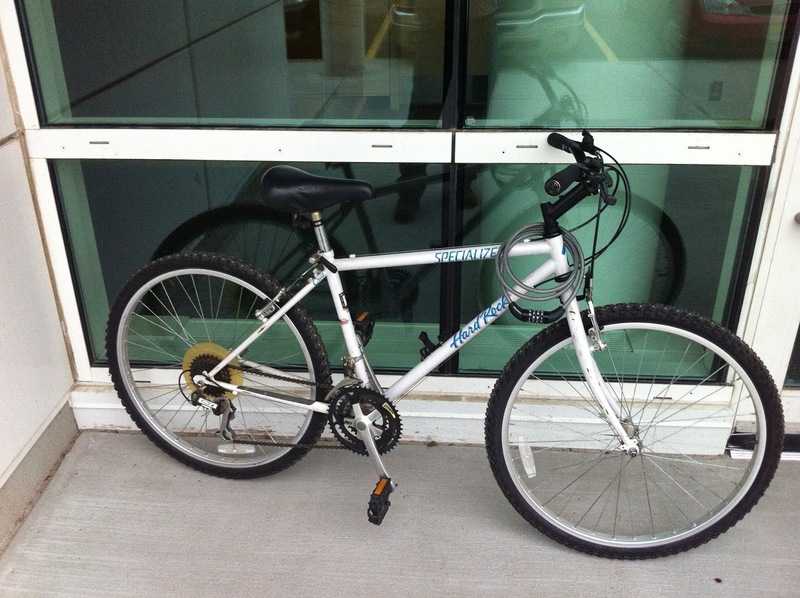 Great deal and a great bike. Love the studded tires, too. It sure doesn't take long to get out of shape for the effort of hauling one's own weight up a hill. Winter is killer for activity and summer can be spend riding around on or in something motorized. Best of luck on this and I'll be making my effort, too! Now the parking authorities will have to snow plow the motorcycle spot as well, when you get there with your hack. Actually, I may throw in a shovel to clear snow when I want to park there, which isn't that often. We'll see how things go this Winter. On lower campus, the motorcycle parking spaces are usually at the ends of the rows and not normally plowed with the rest of the lot. If I can make it out of the driveway, I shouldn't have any problem on campus. That was a good score on the bike when you bought it, but sad the old couple couldn't use it like intended. 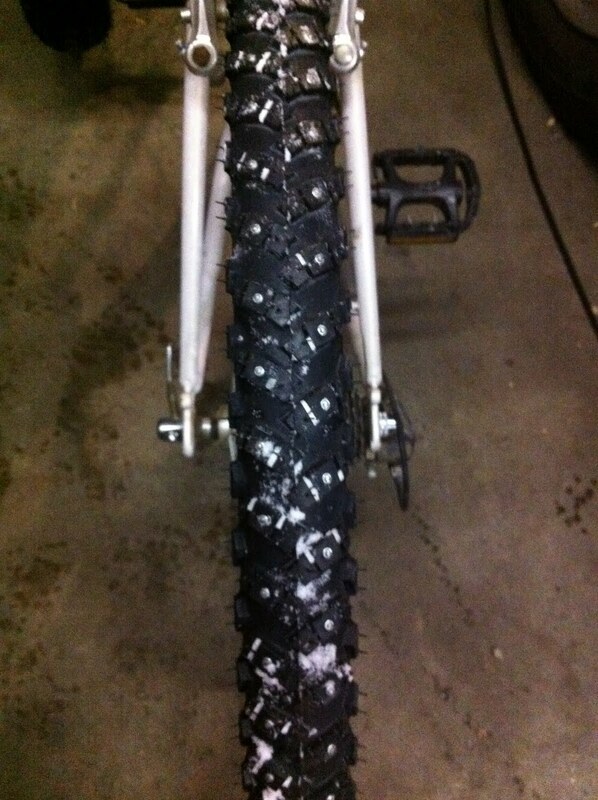 Have fun riding with the studded tires. I know I am out of shape when the small hills make the legs burn. I thought it was sad that they didn't use the bikes as they intended. I think it was one of those things that they got and set lofty goals of riding now that they were retired and had more time. To have more fun, I need to get into better shape. Studded bicycle tires. I have lived this long and never seen such things. Neither has anyone in my office. To carry stuff on two wheels check out Aerostich Courier bags. Not cheap, waterproof and comfortable, and hard wearing. I've looked at the Aerostitch Courier bags but have never seen one "in person" yet. I have been thinking of an electric model . . .
About the only thing I saw on our trip to Japan that I wanted to ship back home was one of the electric assist bicycles. They weren't sold in specialty shop but were available in the department store. Moderately priced, you saw people riding them everywhere. Even if you think you've been pretty active there's nothing that proves how out of shape you are than trying to ride a mountain bike up a hill. (I did discover that riding a crossover style bike was easier and a street bike even better - if you're riding on pavement.) I'm ready to trade in my high tech mountain model, it's way too heavy.